Live albums are usually hit or miss, as it's no mean feat to convincingly capture the energy, excitement and synergy between a band and audience at a specific point in time. 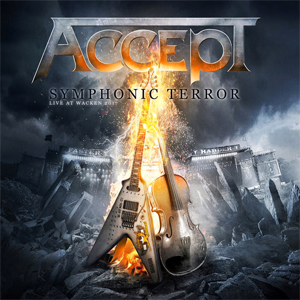 ACCEPT's Symphonic Terror – Live at Wacken 2017 raised the bar further by documenting their one-off performance with a full symphony orchestra (prior to the planned ACCEPT and the Orchestra of Death Symphonic Terror Tour 2019). Therefore, aside from the usual difficulties inherent in creating a memorable show and properly recording the music, there was the problem of successfully reinventing metal compositions with classical instrumentation. Definitely an ambitious undertaking that puts them in the esteemed company of artists such as METALLICA and SCORPIONS. ACCEPT's specific approach to incorporating the orchestra helped to create a sense of structure and progression to the show, facilitated by the fact that they are one of only a handful of bands that can boast a guitarist who has released a solo album for symphony and electric guitar. This allowed them the freedom to divide Symphonic Terror – Live at Wacken 2017 into three distinct movements (to borrow from the classical genre) or sections — which lent the affair a greater level of authenticity. Five tracks in a "traditional" live album setting — four from the Mark Tornillo era and "Restless and Wild". Well done and basically what listeners would expect. Listen and watch on KNAC.COM: "Die by the Sword"
The Czech National Symphony Orchestra accompanies guitarist Wolf Hoffman, Peter Baltes (bass), Uwe Lulis (guitar) and Christopher Williams (drums) on six compositions; five from the Headbangers Symphony disc alongside Tchaikovsky's "Romeo and Juliet". The pairing works surprisingly well, and brings the album to life. It's not a stretch to say that Headbangers Symphony was meant to sound like this (the Czech National Symphony Orchestra also played on the studio release), and the intensity of the performance comes through. Grandiose and powerful, it should please both metal and symphonic music fans. Very likely a career highlight for Wolf. Listen and watch on KNAC.COM: "Symphony No. 40"
The lion's share of the album is found here, consisting of 10 tracks that are an even split between classic material and ACCEPT Mach II. "Breaker" and a vicious rendition of "Fast As A Shark" are highlights, as is the middle section of "Metal Heart", where the orchestra and crowd reprise the main theme of Wolf's guitar solo (borrowed from Beethoven's "Für Elise"). Listen and watch: "Shadow Soldiers"
A live recording is often about capturing an engaging performance of previously released material, and one way to judge its success is how well familiar compositions remain vibrant and are given a new perspective. ACCEPT were able to use orchestral accompaniment and arrangements to add something fresh and interesting, as the supporting melodies and flourishes from the symphony created interest and drama without detracting from the original intent of the songs. Concert albums are generally retouched to a greater or lesser extent, but it is hard to say how much that applies in this instance. However, regardless of any studio work on the recording, ACCEPT prove that they remain a potent live force. They sound well-rehearsed and slick, yet manage to retain an edge. Performing with a full symphony orchestra was a bigger risk, but it also positioned them to create something truly special; or, as Wacken likes to say, a "Night to Remember". The effort paid off, and in retrospect, it's nice that Peter Baltes was still a member of ACCEPT for this event. As Mark Tornillo says to close "Balls to the Wall" and the show, "This was a bucket list tonight for us."